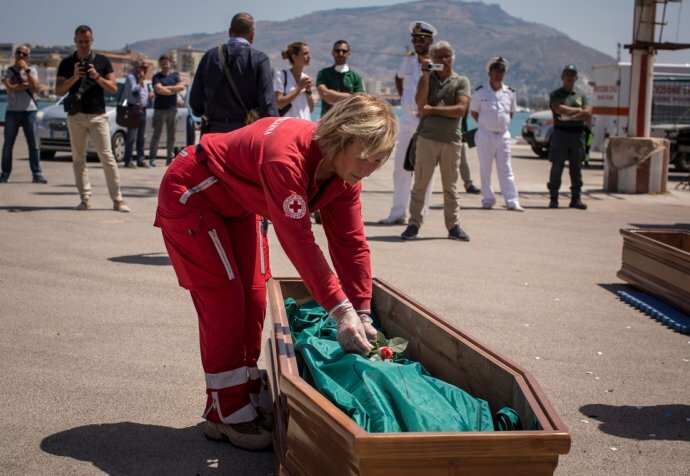 After more than 4,200 deaths this year in the Mediterranean Sea, a new shameful record, the EU can’t continue to ignore and be accomplice to a tragedy of growing dimensions. It must assume the urgent need to start providing safe passage mechanisms. 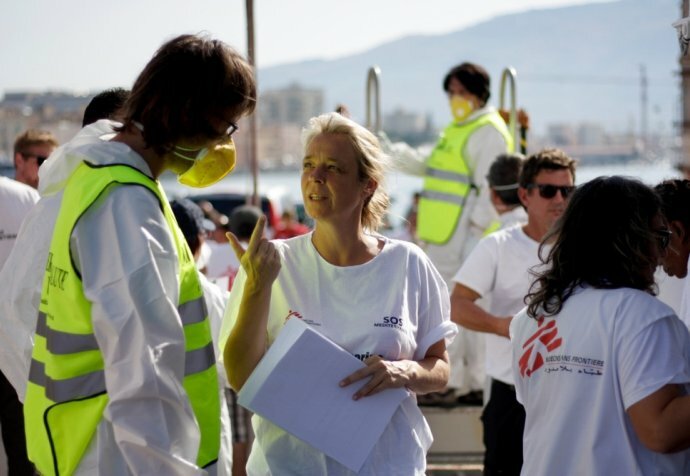 Nicholas Papachrysostomou is the field coordinator of the Médecins Sans Frontières run Dignity I search and rescue boat and he recalls the two busiest days of rescues in October. That day, not far from the Libyan coast, the sun had not risen yet. The sea was choppy. It was 4.20 am on 22 October and we were already nearing full capacity on Dignity I after an intense day before. We were called for a new rescue of a rubber boat that was not very far from our position, so we arrived pretty fast with two semi-rigid inflatable boats without knowing very well what we would find. It surpassed our worst nightmares. When we reached there, the distressed boat was full of dozens of people in panic. They felt alone in the darkness in the immensity of the sea. Their eagerness to be saved was such that they couldn’t wait, they wouldn’t listen. They were a mixture of people from Liberia to Mali, among many other places, men, women and children all carrying a heavy burden of suffering with them. "It surpassed our worst nightmares. When we reached there, the distressed boat was full of dozens of people in panic. They felt alone in the darkness in the immensity of the sea"
Before we decided how to react, people started jumping into the water. They screamed and grabbed our inflatable boats. We began taking them on board but when the others saw that, they thought it was a safe way to go and more people started jumping in. In a matter of minutes, there was a multitude in the sea and the teams were working non-stop to get them on board. Many of them were unconscious, burnt and nearly drowned. We also put in place a medical evacuation with the support of a speed boat from the Italian Coast Guard. As this was happening, we pushed the distressed boat alongside the Dignity I and then we realised the magnitude of the tragedy: there were nine dead bodies inside. It had cracked from within and children and women who normally sit in the middle had been trampled. They suffocated swimming in a mixture of fuel and sea water. My colleagues tied the floating cemetery alongside so we wouldn’t lose it and we let other vessels know about the situation so that the bodies could be collected. The day continued full of more events. In about eight hours we conducted a total of eight rescues. We ended up with 668 people on the Dignity I: a huge number that needed to be cleaned well of fuel, fed and, most importantly, be given information about the loved ones they had lost. It was altogether very tough for us to assimilate. Unfortunately, these kinds of images have become so habitual that it seems difficult to raise any more awareness about the suffering people are going through. For us, these were the concluding operations in October, which ended up becoming the most appalling month of the year, partially because of the deteriorating weather conditions, with gales and big waves as the winter approaches quickly. More than 4,200 people have died or went missing so far in 2016 in the waters of the Mediterranean Sea. This is a record since statistics began to be registered, and there are still two months to go till the end of the year. Médecins Sans Frontières’ three boats (Aquarius, Bourbon Argos and Dignity I) have rescued nearly 18,000 people this year and about 333,000 people in total have arrived by sea to Europe. Each and every one of these people has a face and a story of hardship: some flee wars, others face different kinds of discrimination, violence and persecution or a scarcity of resources. Their journey of suffering begins in countries that range from as far as Pakistan, where conflict has become chronic, to places in the heart of Sub-Saharan Africa such as Nigeria, Eritrea or Somalia, and a Middle East ravaged by years of tension and instability. A large part of them have a nightmarish stop in Libya where, according to interviews with hundreds of people conducted by our medical teams, many suffer detention, sexual violence and torture. "Their journey of suffering begins in countries that range from as far as Pakistan, where conflict has become chronic, to places in the heart of Sub-Saharan Africa such as Nigeria, Eritrea or Somalia, and a Middle East ravaged by years of tension and instability"
On 3 October we carried out a rescue in collaboration with an Irish warship. When we arrived, we realised that some people had been in the water for quite some time having already inhaled fuel and drunk a lot of sea water. There were a few critical cases of near drowning and soon our hospital was crammed. A 34-year-old pregnant woman from Nigeria died after we failed to reanimate her. This was only the beginning. As the medical team was treating dozens of patients for burns and other problems, I started receiving difficult queries. A mother asked about the whereabouts of her children but we didn’t have any more children on board to account for her. Eventually, the management of the Irish warship told us that, in the midst of the busy rescue operation, there were six bodies in the water that couldn’t be recovered. These people died anonymously. They were not even registered, given that their bodies drifted away in the sea. When I told the mother about this development, she collapsed in front of me. She had tried to secure her two children, but the boat cracked and broke and she found herself in the water, unable to hold onto them anymore. She maintained the hope that they would be alive somewhere. But they weren’t, and they met the same fate as four other adults. Nobody deserves to die anonymously in the sea. Nobody should even be left on their own to risk their lives crossing a dangerous route in flimsy boats with a predetermined fate. No matter how big an effort Médecins Sans Frontières and other organisations make to mitigate this tragedy, it will continue to unfold beyond our capacity. We will continue to encounter situations that surpass our worst nightmares. The European Union and its member states can’t continue to witness and be accomplices to this. They must reverse their policy towards refugees and migrants arriving at their borders. Rather than focusing on deterrence measures and externalization agreements, Europe should invest much more in reception according to EU standards and develop an approach designed to address the medical, humanitarian and protection needs of people arriving at its borders. They must respect the right of people to seek asylum and they must realise that it is urgent to start putting in place mechanisms for legal and safe passage.